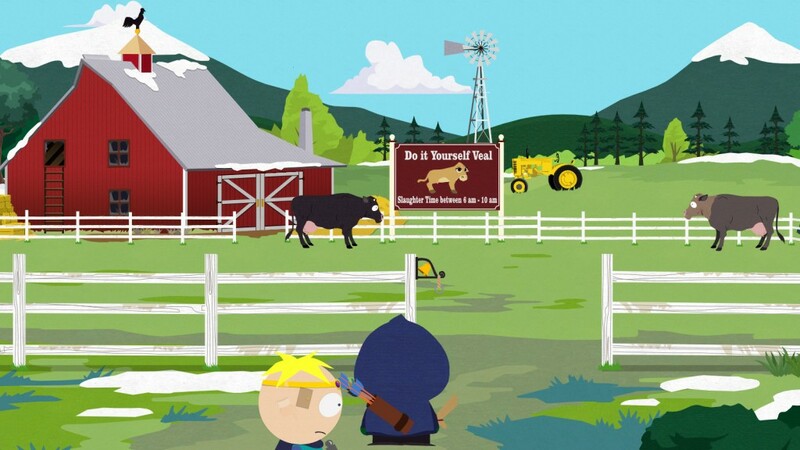 South Park - The Stick of Truth created by Ubisoft. Al Gore is hiding between the Bijou Theatre and Tweek Bros. Coffee in northern South Park. You'll find him behind a tree, harkening weirdly to you as you pass by. Mildly creepy, but there you go. Al Gore needs you to plant three ManBearPig Sensors in locations around South Park. All three are in relatively distant areas, so this will require some walking. Consult your map to receive exact locations for each of the Sensors. First up is the Farm. You can find it to the northeast of Al Gore's hiding spot, past the U-Stor-It. Despite how this area looks, you can squeeze through on your first visit. The gap between the sidewalk and the ramp beside the homeless dude is just very, very small. Beyond is a dirt path leading north; take the path to get to the Farm. - Might as well shop around for items first... except there aren't any. Really? Yeesh, under-utilization of a perfectly good cow pasture, that. - You have to plant the Sensor on top of the Barn. The front door is locked, but you can get in via the ladder and broken window at the rear. Getting to Kenny's House is described in the Hot Coffee side quest article. It is absolutely necessary that you complete this quest first, as you can't get at the transformer above Kenny's Garage if you don't have the McCormick's Garage Key - and it's only handed over by Kenny's mom during the aforementioned quest. So, yeah, hop to it, soldier. - After making your way into the Garage and beating up the Meth Heads, climb onto the shelves in the rear of the room. To your left you'll see a gleam on the roof; use your bow to blast it down, revealing a ladder to the attic. - Climb the ladder. Along with a chest containing Kenny's Bloody Club you'll find the transformer. Attack the Sensor and skedaddle outta here. The final ManBearPig Sensor spot is in Stark's Pond, a short walk west of the Church in western South Park. If you've already visited the Church you can jump there via Sir Timmy's Fast Travel. - Wander west to Stark's Pond. Beat up the trash can for a Bottle Cap. - Further west is a wood pile. To the left of the wood is a tree that's hiding a bag. Inside the bag is a Power Potion, a Health Potion, Generic Sunglasses, an Untidy Wig, Spoiled City Sushi, and a Wing CD. Just past the heap of wood is the sign where you need to plant the ManBearPig Sensor. - Zip back to Al Gore after planting all of his stupid Sensors. He'll run off after giving you Al Gore's Storage Key. Follow him to U-Stor-It. - In case you haven't collected stuff here yet, activate the Sir Timmy Flag outside the storage facility, then speak to the Street Merchant to see his wares. After that, bypass the ramp leading up to the U-Stor-It sign and check out the back of the truck; you can step inside and find a Crazed Hobo hiding under a heap of trash. Beat him up and climb the ladder in the truck to find a box containing a Fractured Bulb, Yellow Orange Dye, a Ceramic Shard, and something else. - Return to the ramp by the Street Merchant and climb up. Shoot down the ladder so you can get at the sign, beat up any elves you may see up here, and climb down into the storage lot. - Check out the rental office first. Hit the magazines and the trash can for Crumpled Paper, then interact with the lock / unlock button by the desk. It'll open the front gate. - Cut scene! Al Gore gives you a 'Defilibrator' and tells you to put it somewhere underground. Ooookay. Mash up his stuff for a Striped Straw, Crumpled Paper, and a Bottle Cap, then head out again. - Head west of Tom's Rhinoplasty. Activate the Timmy flag here, if you haven't already, and go down the manhole to your left. - Up until this point you've had no trouble completing this quest. Unfortunately, you now hit a gap that you cannot cross until you proceed far enough into the main quest line to get a specific ability: the Alien Probe. Once you have that, use it in the sewers to cross the gap in the path. On the other side is a bag containing a Valkyrie Patch. Descend the ladder ahead. - Sewers! Yay. Check to your left upon leaving the ladder for a small latch hidden by trash. Inside is $1.00, a 'Nugget', and a TV Award. - Use your ranged weapon to shoot the wheel above the flow of sewage ahead. It will make the flow sporadic. Run through when it stops and hit the gold wheel on the other side to stop the flow altogether.